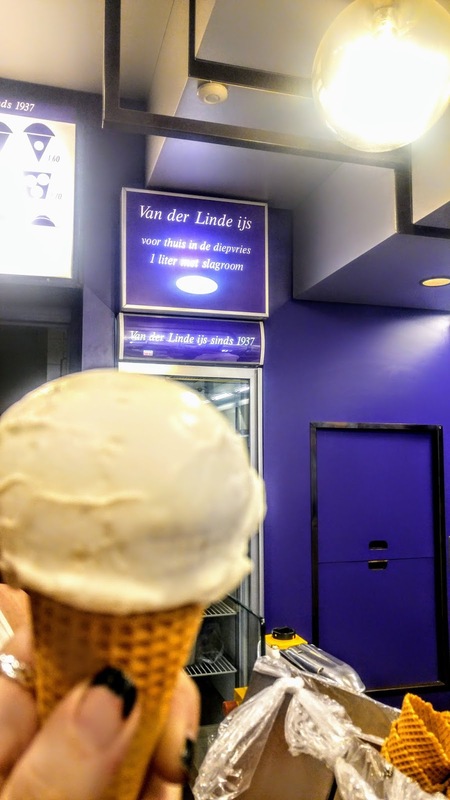 Banketbakkerij Van Der Linde Bakery in Amsterdam: VDL has the best ice cream! My bestie, Suzanne, told me about it before and insisted that we go straight away! It's ice cream that's made with whipped cream, so it's much, much lighter than traditional ice cream, softer serve and airy. It's blissful and almost sinful. Plus, you get the choice of getting it in a cone, a dish or served between two waffle cone flats for an ice cream sandwich option. Have not actually gotten any baked goods from the bakery but I'm sure they're used to that. 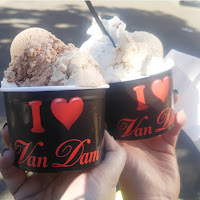 Chocolaterie Van Dam near Haarlem in Heemstede is my second best flavor option. Though it's just outside of Amsterdam, it's a newer location in comparison that almost always a line. My second trip in to Holland, stopping here was the very first thing we did coming from the airport. The flavors are rich and creamy; not watery or have ice chunks like in some American parlors and the flavor array was mind blowing. Suzanne and I both picked four flavors because we couldn't pick- I got Speculoos, Hazelnoot, Framboos and Citroen. Figure it out!? Speculoos (almost cookie), Hazelnut, raspberry and lemon. The lemon was my favorite- it was like an ice cream version of extra lemony Italian style lemon ice with the flavor. It tastes amazing and almost impossible. We got a few other flavors in a carton to bring home for later because I was told we had to try everything! There were also chocolates and bonbons and things to buy but we filled up on ice cream here, too! Frites- French fries.They're everywhere! I'll daresay more than in America because you can get a bag of fries almost anywhere here, I swear. I'm even used to fries here in America, but it's mostly a side dish- something you get in a combo meal at dinner or as a midnight snack. But in the Netherlands it is more of a centerpiece. 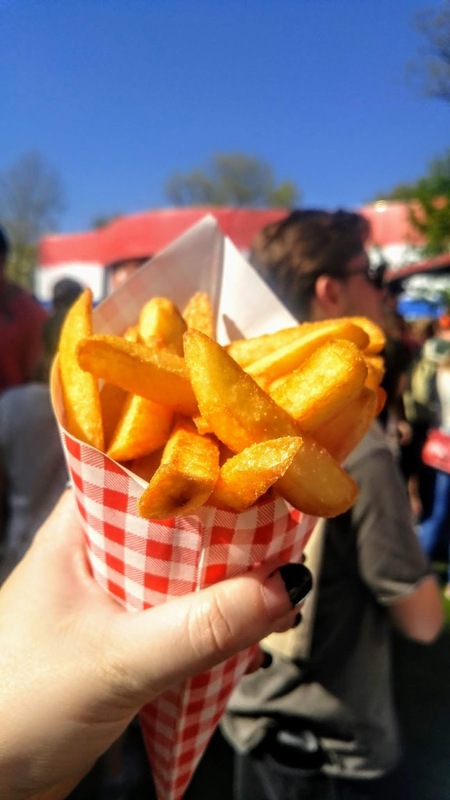 Rumor is that Belgium invented the "French" fry, so it only makes sense that their neighbor, Holland, is part of the action. Only, of course, their fries are served with (an optional) mayonnaise dipping sauce. It's less tangy and a little more spicy than our regular Hellman's or Miracle Whip. For the non-mayo lovers you can also get a sort of Thai peanut sauce to dip, of which I still did not love. I'm a Ranch. Never a ketchup. Sadly, you won't find much ranch dressing here unless you bring a packet of mix yourself and make it on the go. But like at any festival, carnival or kiosk anywhere, the fries here are bountiful and waiting to be ordered. But unlike American festival fries- they're not soggy and sitting in a pile of their own grease. It's a perfect golden fry jackpot. Febo! I love this little self-serve hot snack place! I'm not even sure what to call it because there's a counter to order burgers, buy drinks and so on but there's also a wall of ovens warming freshly made snacks and fried foods, and still more burgers galore*. I loved the Kaassouffle and got that every time, sometimes one right after another. It's hot and crispy and has a soft cheese center- but not a lava cheese filled with regret, a perfect snackable kind that tasted a little like kasseri cheese. Febo had a veggie burger there, but I'm rare to trust veggie patties in restaurants at all, so a warming wall version seems less exciting. Peter tells me that Febo in dutch also means something naughty that makes him giggle, but he won't tell me what. And I'm afraid to ask. 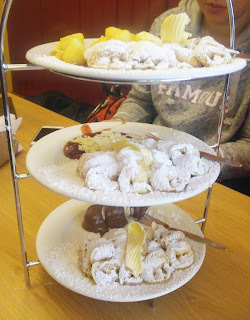 Oliebollen (or Olie Bollen, Bollen or -Bollen like Rozijnbollen): I must admit that I am a fanciful desert lover. 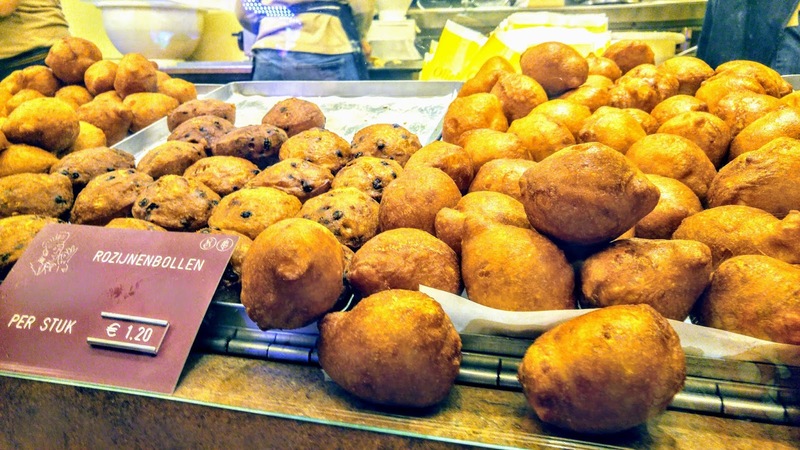 If you saw my last post you would understand, but I really liked Oliebollen. It is more of a simple fritter or donut that can have an array of toppings, fruit or even raisins right in the dough to be fried, like I had at the Lisse carnival. They were sold out of the Nutella flavor, which I had my eye on, so I got plain and it broke through my initial calorie disappointment in the first frosting sugar coated ball. Though typically a New Years tradition, we had these at the fair, and I hear you can buy them on the street in winter for a bit of warmth. Now that seems like a delightful idea! 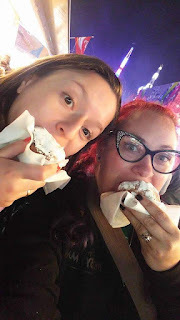 Poffertjes: Though it can be a street food, I hadn't seen any vendors selling them on the streets, but I'm sure there were a few shops. They're like little pancakes, but have an air pocket and more butter. We got a three tiered array in Efteling and chose the whole shebam; we had jams and jellies to dip, powdered sugar, fresh butter, nutella I think, and probably more. We ate every bit of that tray! Then we watched them being made in the window with an iron pan and what looked like wooden skewers flipping them from one end to the other. Pretty good stuff and next time if I see a guy hawking some on the street I will deffo get a bag with butter. Stroopwafel: My favorite Dutchie treat! I eat them at home plain or with hot tea, but, alas, I did not have any while walking Amsterdam! The price of one on the street (in a shop) there is the same as buying two bags of them pre-made at the store, so I bought a few bags to take home instead. But, the pull of one made fresh and hot with toppings is exciting. Next time, just to do it, maybe. But seriously, it's kind of expensive and a better bet would just be to pop into Hema and get some for the road. To sum up, Amsterdam is incredible, come hungry and bring exact change. Be kind to one another and eat up! Oh yum! These look amazing! I've heard good things about Amsterdam's food! These all sound amazing. If I had to pick just one, I'd go for the lemon ice cream! I'm definitely going back for that, but i think it may just be a nice weather flavor! Wow - the pictures and food descriptions have my mouth watering! I've never tried French Fries with a side of mayo but might give it a try now! let me know if you like it! I don't but my bestie SWEARS by it! Oh my! Everything looks yummy, you make me want to go back to Amsterdam. All sound yummy! No low-carb street food? That's what I'd be looking for! Bring on all the meat! Well, I'm a vegetarian, first off, as I mentioned. Second, there's meat in Febo and other spots, but not a lot just on the street. It's mostly carnival style foods that you can eat while walking like fries and ice cream. what a wonderful post! i have heard such great things about Amsterdam food! thank you for sharing! All of this food looks amazing! I am dying to get to Amsterdam and now I want to go even more to eat all of the food. Oh goodness! Just drooling. The best part is so many veggie options for me. Me too, been a vegetarian for 23 years so when I write I try to do it mostly from a veggie POV since that's less common. but i am always down for cheese! Wow! The food sounds amazing! 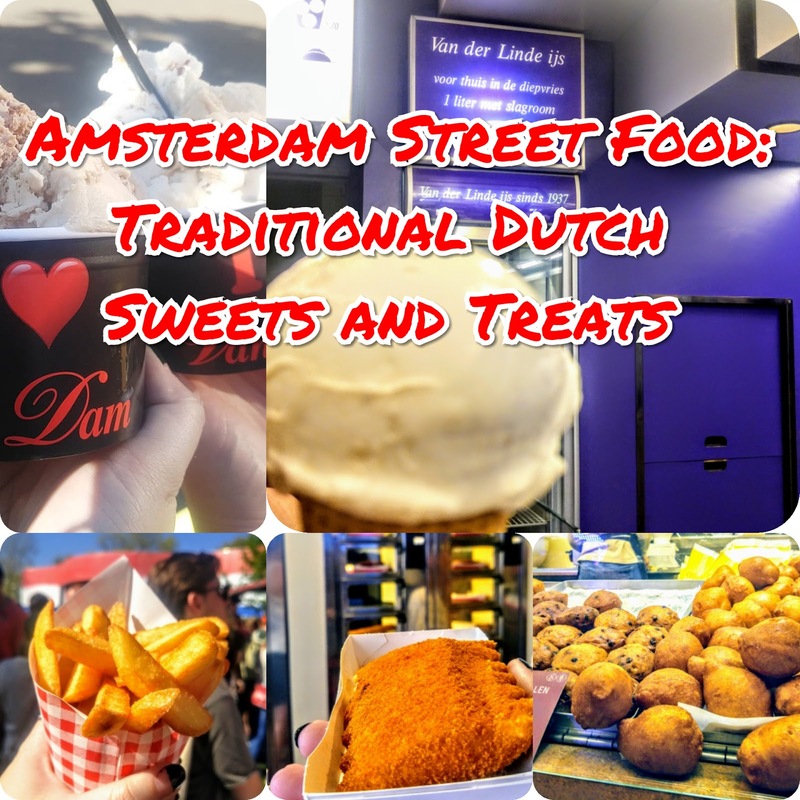 I want to go to Amsterdam now just to try all the amazing sounding food! Yummy! A change of plans meant we never visited Amsterdam, but I'd love to go one day. Febo sounds like a lot of fun. It seems almost like a fast food store but more unique. What a bummer, hopefully you can get there once! 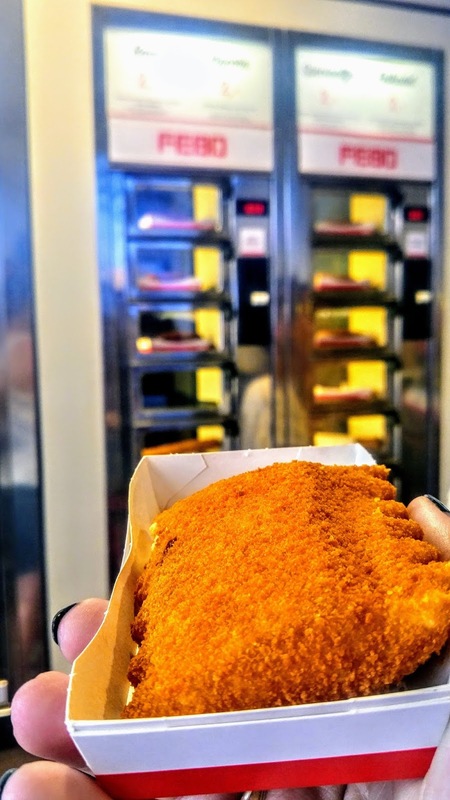 Febo IS like fast food, only the food is fresher (thn US fast food places at least!) and it all sells out as soon as it's put in the window, so you know the ones you're getting is top tier! Good to know the fries are so plentiful and tasty -- that's one of my weaknesses! Delicious, i was there so long ago I cannot remember what I ate lol. But I have made Oliebollen which are amazing, and Stroopwafel are the best! All of the foods sound yummy. Nice insight on Amsterdam's foods. Me too!! I usually find a snack shop and a dessert shop right away! They're all in walking distance except van dam! Amsterdam is definitely on my list! I will definitely keep all of this in mind when I get a chance to get there! Thanks for sharing, your suggestions are top notch! I've been to Amsterdam a few times and have only tried the Stroopwafel from your list. I'm not big on sweets but it was enjoyable. I have a few more things to try next trip! Im huge in sweets, obvi, but there were about 10p other options! I was just there for Christmas. Loved all the food. I have been to Amsterdam and tried a few of the things listed. I remember the fries most...yum. Such delicious food. Thank you for sharing. Thanks for stopping by! Hopefully you can go again! I absolutely LOVE street food. You can really get a true feel of the culture by eating from these vendors. This is so much fun!! I love knowing exactly where to go when it come to places we are traveling, especially when it involves immersing in the culture! thank you for saying, that's why i do stuff like this! As a vegetarian it can be difficult to eat enough while flying blind sometimes!